Well, not really. You're so far away! But, I will show you a little something. I was trained in the traditional metal smithing style, in which finishing is a long, involved process. A running joke in my class was, when a jeweler is asked "How do you make a ring? ", she answers, "Well, first you take a piece of metal. Then you file it, file it more, and file some more. Then you sand. Sand some more. Sand a bit more, and then keep sanding. Then you polish, polish, polish. And you're almost done!" In Japan, there was the added step of hand burnishing your piece. Yes, you read that right. Hand burnishing. We had a little burnisher, and were instructed to rub the piece - with pressure - until the appropriate shine appeared. We all looked like little Aladdins, rubbing the lamp hoping for the genie to pop out. It was truly ridiculous (and of course I loved it). And when I say sanding, I'm talking about multiple steps. Same with polishing. Sanding involved stepping through a variety of grits: starting at, say, 400, then working up to 600 then 1,000. Polishing involved stepping through three types of polish - Tripoli, White Diamond, and Rouge - on a polishing machine. Yes, the finish is gorgeous. No, you can't touch it (*smack*). Now, for those of us working in a humble home studio, there has to be a better way. For one thing, space is at a premium and I just don't have the room (right now) for a polishing machine. For another thing, many of us just don't have the budget (right now) for a polishing machine, which can run anywhere from around $200 on up to $700. Gulp. Luckily, there is a great alternative that is both economical and effective. It's called a tumbler. Also known as rock tumblers, these are little machines that can be used with various media (more on that later) to give you whichever finish you desire. They come in two styles: rotary and vibratory. The vibratory tumbler has a little "pod" that sits on top of a base that vibrates. Raytech makes a popular model, which sells for around $105. I have two drums, so I can keep the media separate. It keeps things simple, and the drums are a perfect way to store your media. There are different compounds you can use with your media, but I just stick with Dawn dish soap. I pick my drum, with appropriate media, drop in my pieces and a few drops of Dawn, and then I add water to about an inch over the media. Seal the top, and you're ready to tumble. For the steel shot, you can go anywhere from 2 hours to overnight, depending on the level of polish you want. I run the plastic shot for a much shorter period of time, because I don't want to wear the pieces down too much. I'll go anywhere from 30 minutes to 90 minutes, depending on the piece. I also rinse the individual pieces as I find them, then lay them on a paper towel to dry, and that's it! I have to confess I have a "tumbler crush" on my little Lortone. Once you use one, you'll understand. Happy tumbling! I'm planning to write a few posts about how I organize my workspace: the gems and findings, tools, shipping materials, etc. I'll start with gems and findings. Well, mainly gems. I guess findings will have to be yet another post, as I'm currently in the midst of getting them organized. It took me a while to come up with my current system; I used to just keep most everything in baggies in assorted larger boxes. The rest, the stones and findings I used most frequently, I kept in clear plastic containers in varying shapes and sizes that I used to get by the shopping-bagful at Tokyo Hands. (I still have some remnants of this older system, but now I use these old jewelry boxes for findings, mostly. And, yes, I used to ship my jewelry in pink boxes. Really. But I had a good reason: the color went with the plum blossom theme of my original business name, Double Blossom Designs. Now I use kraft boxes tied with hand dyed silk ribbon to add color, which I like because I can switch out the ribbon depending on what colors I'm currently favoring). But after a couple of years of regular gemstone...ahem...acquisition (read: non-stop buying), well, the baggies just didn't cut it any more. So I switched over to little drawers, in which I sort stones by gem and shape. I also have some larger drawers, where I sort by stone only. For example, I have a lot of emerald gems in different shapes and sizes. But I may only have one strand of one shape, or even a handful of stones in a certain cut, so it would be wasteful to take up individual little drawers for each variation. So in those cases, I do put the gems in individual baggies, but then I aggregate the baggies in larger drawers. It works very well for me. These pictures show about half of my gemstone drawer units. The others are in a bit of disarray, as I'm reorganizing my workspace. But once they're ship-shape, I'll post pictures of them, too. I just want to add that I think one of the reasons I get so many custom orders is that when someone writes and says, "I'm thinking of a necklace with blue stones....", I can pull gems in numerous shapes, sizes and colors and offer a lot of choices. It's something I don't take for granted, though. It took me years of collecting gemstones to get to this point. And organizing and keeping track of everything takes a lot of time, obviously. But I enjoy being the sole curator of my precious collection. And if there's something special you're looking for, no matter how improbable - a polished ruby nugget in the shape of a teardrop? A Tahitian pearl? A leaf carved from emerald? A prehnite pyramid? 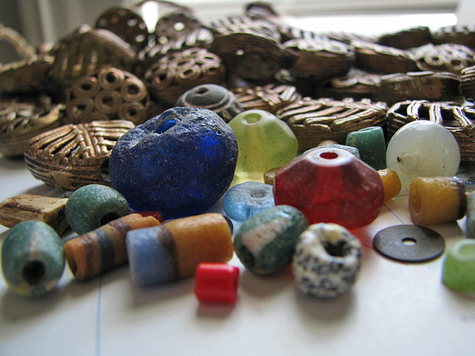 An ancient Roman glass seed bead the color of the Aegean sea? - chances are I've got it. Lucky you! I made these lovely Twinklettes yesterday. They're the dangles on my popular Twinkle necklace. I try to make them in batches, because they sell rather quickly and I like to have them on hand as orders come in. These are fresh from the tumbler, and oh-so-shiny. Aren't they lovely? I recently received two packages from Africa. One from Ghana, and one from Kenya. 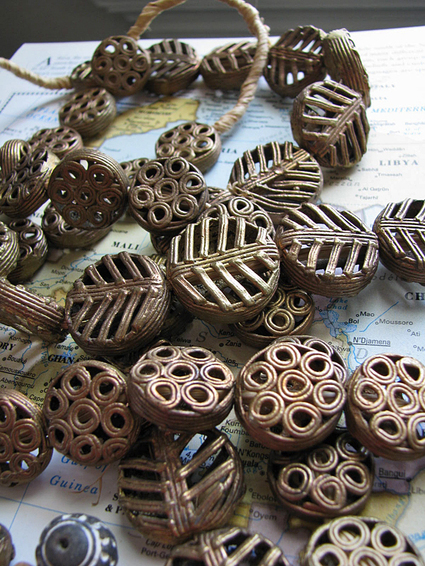 They contained these gorgeous tabular brass trade beads that I ordered, along with some lovely glass beads thrown in for good measure. They're made using the lost wax method: each bead is made from wax (looks to me like they used those really thin wax sticks), then set in a mold. Molten brass is poured in, replacing the wax with brass, and the bead is left to cool. After a while, you break open the mold and, voilà! A tabular bead. 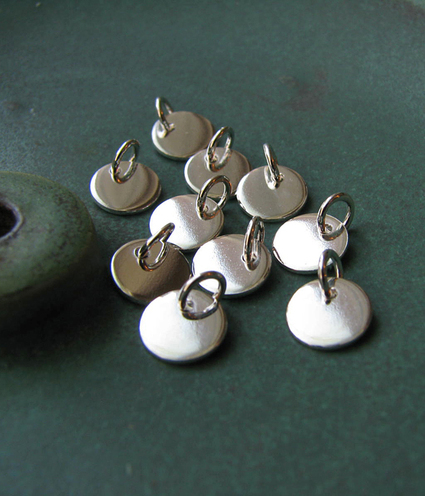 I've been wanting to use bone beads in my work for some time now, but I've always felt a bit hesitant about doing so. On the one hand, bone has such a lovely, organic quality and a subtle luster that I find beautifully appealing. On the other hand, bone is obviously an animal by-product and I wondered about the origin of the beads I admired. Recently I began shopping at a wonderful bead shop here in Boulder, and noticed their display of bone beads. Well, bead shop doesn't really cover it. Jake at Nomad Design sells beads, artifacts, decorative elements, furniture, tools and supplies, local and Asian jewelry, and he has a rotating display of art by local artists and painters. 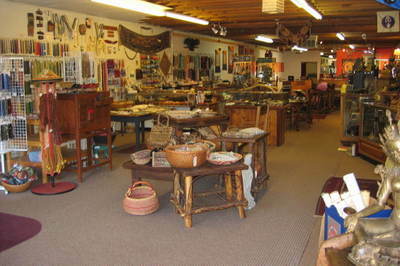 The store is really quite an experience, and I always love going there and getting lost among all the treasures. This great shop is a local fixture, and a vibrant part of our community. So, last week I decided to finally ask about the bone beads. Jake gave me the lowdown, and I'll pass it along to you. 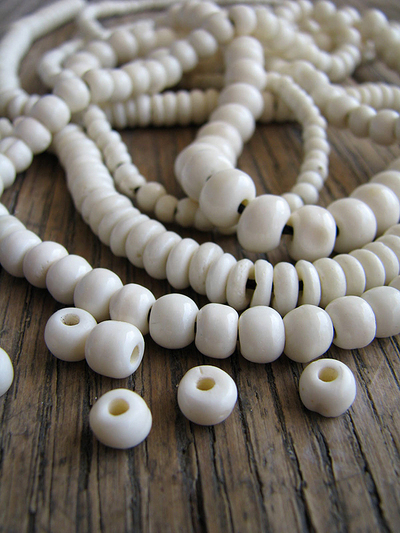 First, the bone beads Jake sells come from domesticated water buffaloes in India. Second, they were bought directly by Jake from a handful of villagers with whom he has ongoing relationships. He doesn't advertise himself as Fair Trade, but said that he knows the villagers are very happy to do business with him, and he pays them fair prices for their work. I decided to buy a few strands, and do a little research of my own. 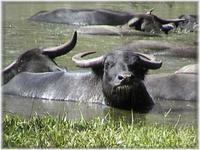 Also known as yaks, domestic water buffaloes are plentiful and not at all endangered in southeast Asia (although their common ancestor, the Wild Asian Water Buffalo is endangered). They are used for meat and milk, and are a vital part of the economy in many Asian countries. Their skin is used to make leather (used mainly for shoes), the butterfat of their milk is used to make ghee (cooking oil), and their dung is used for fertilizer and fuel. They are used in so many positive ways, it makes me feel much better knowing that just about every last part of the animal is used and not wasted. And, just as important is the income these products provide to people who need it. I hope you found this information helpful and reassuring, as I did. I'm not a vegetarian, but I do only eat organic, naturally raised meat. And I'm not opposed to using certain animals for human consumption, or for making goods, but I do feel that such use should be purposeful and done with as much compassion and awareness as possible. And...here's a little preview of the new pieces I'll be making with these beads. 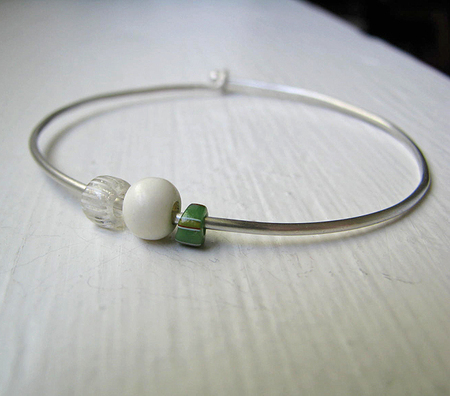 This bracelet is in my shop, and more will follow. Enjoy!